I can honestly tell you that our Bistro Broccoli Cheese Soup is the best broccoli cheese soup ever, I mean it this is one seriously good soup! It transcends Panera by leaps and bounds, plus it’s super easy to make! A one pot wonder that we’ve boosted taste on by sautéing the vegetables and then browning the flour to pull out every last drop of flavor. Did I mention it’s easy to make too? It is! Why should I sauté the vegetables first? Maximum flavor! Remember when there’s no color, there’s no flavor. Boiling, poaching, and steaming have their place in our kitchen for sure. BUT for so many dishes taking the time to develop color and aroma will deliver your dishes to the next level. It all has to do with the magic of the Maillard reaction if you’re a food nerd like me you can read more about that in the above article. Or of course, you can jump to the recipe and get cooking! Broccoli is botanically known as Brassica Oleracea Italica and is native to the Mediterranean. Engineered from a cabbage relative by an ancient Italian civilization known as the Etruscans who were deemed horticultural geniuses. The English name broccoli stemmed from the Italian word broccolo meaning “the flowering crest of a cabbage,” and the Latin brachium meaning arm or branch. Introduced to England in the mid-18th century, broccoli was referred to as Italian asparagus and did not become popular until southern Italian immigrants brought it over in the early 1920s. 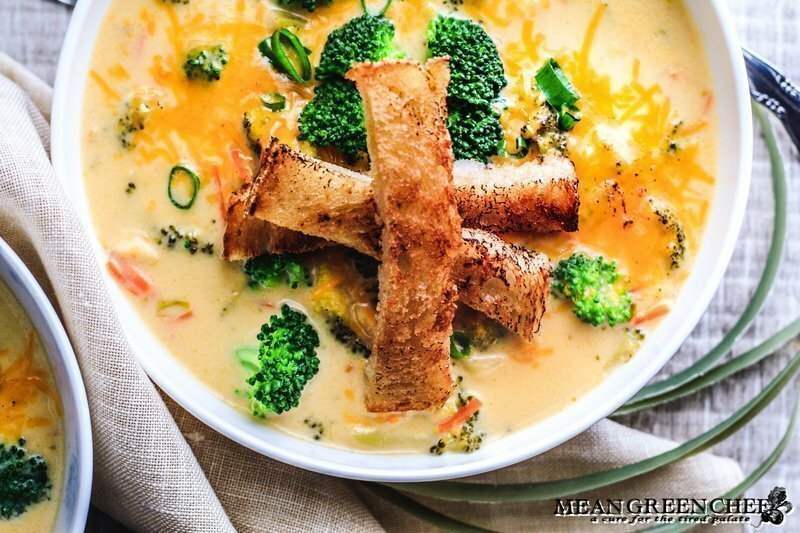 Ooey gooey extra cheesy broccoli soup, not just for cold winter days, we crave it year round! Our Bistro Broccoli Soup is the best broccoli cheese soup ever. I mean it this is one seriously good soup! It transcends Panera by leaps and bounds, plus it's so super easy to make! Heat a large heavy-bottomed Dutch oven over medium-high heat. Add the 2 Tablespoons of butter and heat for 30 seconds, then toss in the onions, celery, and carrots and cook for 2 minutes until the onions start to become translucent. Add the broccoli florets, stir to combine. Sauté for an additional 3 minutes until vegetables become slightly tender and fragrant then toss in the garlic and cook an extra minute. Slide the Dutch oven off the heat and scoop out the vegetables into a large glass bowl, set aside. Move the Dutch oven back over medium-high heat and melt the 1/4 cup of butter and then add the flour and nutmeg. Cook the mixture for 5 minutes, stirring frequently with a flat-bottomed wooden spoon until it begins to brown. After 5 minutes have passed, then begin to add the stock slowly. Stir continuously until the flour and stock are thoroughly combined, next pour in the milk and cream and add the vegetables back into the pot. Cover and reduce heat to low, simmer for 20 minutes, or until you're happy with the tenderness of the broccoli. Stir in cheese and allow it to melt, stirring regularly. Taste and adjust seasonings if needed. Then either serve as is, or mash it with a potato masher to break up the broccoli a bit, or transfer to a blender in two batches and puree completely. If you puree it in a blender, return it to the heat and allow to warm back up. Add a splash of broth if needed to thin the soup to your desired consistency. Store in a tightly sealed container in the fridge 3-4 days. Store leftovers in tightly sealed containers or heavy-duty Ziploc bags in the freezer up to 6 months. Defrost in the fridge overnight or on the countertop for 2 hours. To reheat, add to a heavy-bottomed pot and warm slowly over medium-low heat until heated through. Looking for more great soup inspiration? Then you make like a few of our other recipe creations! We 💙 LOVE 💚 seeing your creations! So don’t forget to tag us @meangreenchef or #meangreenchef so we can see all your great shots!